It has been a while since you've seen anything on my wedding planning process. Honestly, it has been pretty overwhelming since I am the planner of my own wedding. It has also been crunch time for me as the days are just passing me by. Just when I thought I could relax a little, it's already the end of September and I have 3 months to go! If you too are going through this same feeling, my heart goes out to you! What I want to talk about today is where to even start. Getting engaged is rainbows and butterflies and that's the part I enjoy. What I don't enjoy is the long check list and the work that comes with it. If you are one that works well with to-do's and enjoys planning party's, then more power to you... I, for one, am not that person. I have partnered up with WeddingWire again to show you that with their help, it can all be a breeze! So you've celebrated your engagement and now it's time to start planning. If you're not clear on where to start, you may feel like you want to do everything all at once and it can drive you stir crazy. Since everyone's vision for their wedding is different, we might all start in different places. WeddingWire has a really cool quiz that you can take to tell you what your start should look like or what your next steps should be. They take into account where you are in your wedding planning process, if at all. I myself took the quiz and at this point, I still need to finish booking the rest of my vendors like a band and my cake! If taking the quiz is not your thing, they also have an extremely helpful checklist that you can live by. One of the first things that I did to help jumpstart my process was figure out a theme. 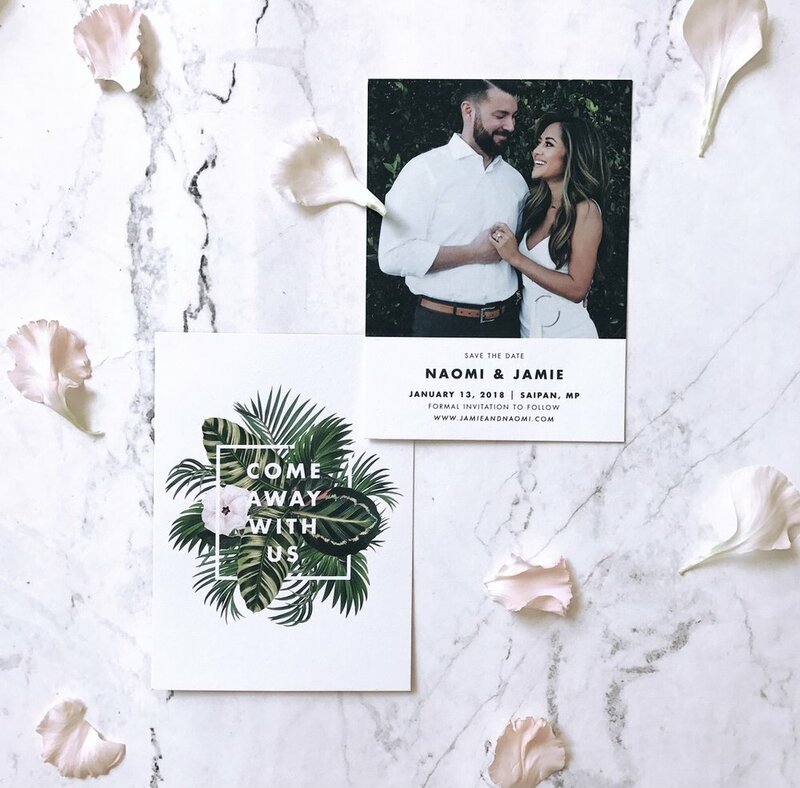 The theme is extremely important because it sets the tone for everything that has to do with your wedding... from invitations, to decor, website, dress and venue. I feel like once you have that down, it will guide you to everything else. Read my post on How To Find Your Wedding Theme. WeddingWire gives great inspiration of real weddings so that you can picture yourself in it. It makes it easy to choose the kind of wedding you may want. Next, we chose a venue. Since our venue is on a tropical island, that's exactly the direction we took for our invitations, website and decor. To give you an idea, I've attached some photos of our invitations. Since we are having a tropical destination wedding, I wanted something that would jump out at people to get them excited to get away. We used Rachel Marvin Creative to draw them up. The palm print has been a little played out by now so I was very careful not to make it too animated or whimsical, but more edgy and modern with a touch of romance. What I love about our invitations is that there is a different element of design for the back of each card, and that the marble lining for the main envelope is something unexpected. For us, a website was necessary to help our guests keep track of things that are happening. We used Riley & Grey as our web host. You can also host a free website though WeddingWire. We wanted to touch more on the elegant theme and went heavy on the gold. I wanted to stay with classic colors so we went with a white, gold and green theme. Our venue represents lush gardens and sits right in front of the ocean. I felt like it tied in nicely with the whole theme of our wedding. If you feel like you're going in a similar path, but need more direction, use WeddingWire to help with theme, venue, website and more!